Every thing around us has an effect on something within us. Everything in the Universe – the stars, planets, satellites, and even the moon have a certain frequency. For example, the frequency of the moon affects the mind and influences our feelings, emotions, and desires. In ancient times, it was common to make ghee as the moon developed into a full moon. This practice of making ghee on a full moon is considered auspicious because the moon is thought to influence “Soma” – the source of nourishment, nectar, and bliss. Soma is a Sanskrit term which is derived from the root word “su” which means ‘to energize, stimulate, expand, and grow’. Soma is also called “amrita” which means nectar and is considered the nectar of immortality. Soma is that which nourishes all things and making ghee during a waxing or full moon provides for an increase of this nourishing quality of ghee. In a practical way, we can say developing Soma is a way of influencing our own brain chemistry and promoting the secretion of positive chemicals and hormones that keep our nervous system calm, content, and blissful – full of bliss! The ancient science of Ayurveda has long revered ghee as an elixir for health and longevity. Honoring the Moon in our lives and understanding the place of the Moon helps us to develop the Soma within. The Mahamrtunjaya mantra also known as the “Great Death-Conquering” mantra was traditionally used to make ghee. According to ancient myth, the moon was once in trouble as she was cursed by King Daksha. A Rishi named Markandeya provided the secret mantra to help protect the moon. This mantra is said to bestow longevity and immortality for it provides physical and emotional wellbeing. Ancient vedic culture instructs to chant his mantra 108 times, which is considered an auspicious and significant number. 4: … and thus Liberate us from the Fear of Death, by making us realize that we are never separated from our Immortal Nature. 1. Place two pounds of cultured butter [preferably grass-fed, organic, and unsalted] into a heavy yet medium sized pot and turn the heat to medium. 2. Heat the butter until the butter melts making sure not to burn the butter. Once the butter has melted, turn down the heat and continue to cook to a very light boil typically for 15-20 minutes. After about 15-20 minutes you will notice the most amazing aroma of buttered popcorn and the beautiful golden color of ghee. 3. White-colored curds will begin to form as the butter continues to lightly boil. Once these white-colored curds turn into a light tan color, carefully remove the pot from the heat source. Your ghee is now ready to cool until it is just barely warm. 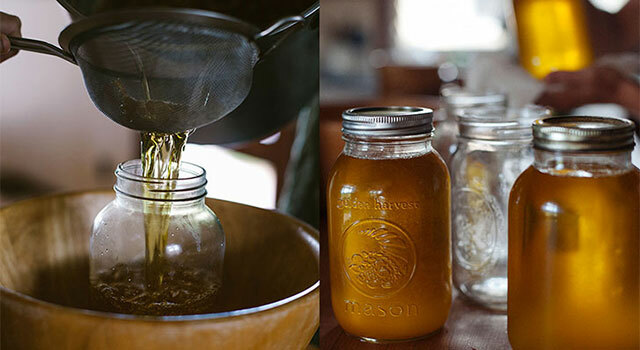 Once the ghee is warm strain the clear ghee into a clean container using a cheesecloth and discard the curds which are left on the bottom of the pot. This is strictly for educational purposes only and NOT to be considered medical advice. Always first discuss with your primary care physician before considering any new health regimen. The 5 Step Ayurveda CleanseThe Alchemy Of Bliss - "Soma"